Rydal Self-catering'Rydal' is an ideally located contemporary first floor apartment in a small private cul-de-sac situated on the edge of Ambleside, just a short stroll downhill to the village centre, and just a bit further to Lake Windermere. Surrounded by mature trees and the beautiful Lakeland scenery. The apartment is a popular base for couples taking a holiday at any time of the year with no need to use the car - perfect! The area offers many opportunities for walking for the active and not so active and there is so much to do in the area. Lake cruises can be enjoyed amid glorious scenery on England's longest lake. Ambleside has a fine selection of local shops with an enviable choice of restaurants, pubs and top class hotels if you wish to eat out. There are two cinemas in Ambleside, daytime activities, lake cruises and cycle hire, or take a walk to the fells from the front door. Accommodation: Outside steps to first floor level where there is a door into a shared entrance porch with hooks for outdoor gear. The comfortable sitting/dining room has a large window with a pleasant outlook and is equipped with a flat screen TV with freesat, DVD, free wi-fi and a radio. Modern well equipped kitchen. Double bedroom with modern en-suite - large walk-in shower, basin and wc. 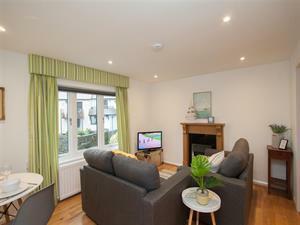 The property has been completely renovated and is furnished in a contemporary style with co-ordinating soft furnishings. Solid oak flooring with a rug in the sitting room and fitted carpets in the bedroom. Gas central heating and hot water will keep you cosy in any season. Outside: Good parking for two cars. Outside courtesy lighting. Short walk to Ambleside village shops and facilities. 'Rydal' is an ideally located first floor apartment in a small private cul-de-sac situated on the edge of Ambleside, just a short stroll to the village centre, and just a bit further to Lake Windermere. No room for cot or highchair. Children welcome from age 16. Rydal offers weekly bookings starting on Saturday.